Every February, we consumers are reminded in many not-so-subtle ways that the rose is the flower of romance, and that we should be buying roses, giving roses, and wearing roses in all their forms. I happen to believe that rose fragrance is a perfect choice for any day of the year, not just Valentine's Day, but I've decided to wear and review some recent and new rose releases all the same. One is a 2011 launch from the classic house of Caron, and the other is the latest offering from A Dozen Roses, a new niche collection that was itself founded in 2011. Caron's Délire de Roses Eau de Parfum is described as "an exquisite concoction...redolent of a spring garden in full bloom," with top notes of blended rose petals and lotus flowers, a heart of lily of the valley and rosebush leaves, and a base of jasmine and lychee. It opens with a sheer cluster of rosebuds and lily of the valley, and it eventually dries down to a soft, fruity rose that stays close to the skin. Between these two floral phases, the fragrance's mid-development is warmed by an unexpected salty-amber aquatic note. Since Délire de Roses has a transparent feeling and light staying power, it would work well as a rose fragrance for warmer weather. Other than that salt-breeze heart, it reminds me a bit of Crabtree & Evelyn's Evelyn (now Evelyn Rose), one of my favorites during the early 1990s. On the other hand, we have A Dozen Roses, a new line "inspired by the emotions that only a rose can evoke," and Electron, an interpretation of the rose's "Clean, Fresh, Fabulous" aspects. Electron's notes include green tea, violet leaves, cattalyea orchid, neon musk, and rose absolute. (As commenters Pyramus and 50_Roses mentioned when we first announced this fragrance, there really is a bright-pink rose hybrid called Electron.) Electron begins with an airy blend of rose and green tea; I enjoyed this pairing so much that I was sorry when it quickly faded and made room for a sweeter exotic-floral note that must be the orchid, paired with a nose-tickling sheer musk. There's an elusive fresh-dirt note that was quite noticeable on my skin during one wearing and much more subtle the next time. The rose doesn't re-appear until the far dry-down, when it's a true, if muted, rose note that lasts for a while. Electron could easily join the ranks of today's "modern" or "updated" rose fragrances: it should appeal to perfume-shoppers who like the idea of roses but fear smelling too old-fashioned. Personally, I wish it delivered more on its promise of an "energizing" fragrance that would give "a shock to the senses." I would have liked some really zingy aldehydes, or even just more green tea. The fragrance itself doesn't really match the colorful packaging, either. (All of A Dozen Roses' bottles feature painterly images of a cropped, single rose on one side and a nature-inspired abstraction on the other side — Georgia O'Keeffe's legacy continues). I haven't tried the other three fragrances in the Dozen Roses collection yet; if you have, do feel free to comment. For another recent rose-fragrance review, see my thoughts on Diptyque's Eau Rose; for further reading, you can also check out Annick Goutal's assorted rose scents or reviews of fragrances by Les Parfums de Rosine, which hit upon the idea of a rose-fragrance collection a while ago. A Dozen Roses Electron is available as 100 ml Eau de Parfum ($95) at Neiman Marcus and Bergdorf Goodman. 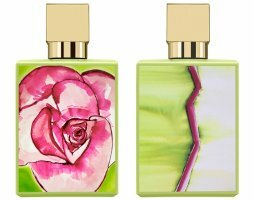 Caron Délire de Roses is available as 30 ml ($100), 50 ml ($165), and 100 ml ($240) Eau de Parfum; for purchasing information, see the listing for Caron under Perfume Houses. KRL, you’d probably have to be a spring-roses fan (which I am) to enjoy Delire de Roses! 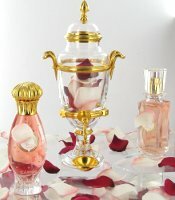 I have only a few rose scents that I like such as Ta’if and Voleur de Roses. I find that a lot of them tend to smell “old fashion” and disappointing. Well, both of these rose fragrances seem to have been created for people who dislike “old-fashioned” roses… so you may want to try one or both of them, if you happen to come across them! They’re both lighter and “prettier” than Ta’if or Voleur, however. They do a nice job with the packaging… it doesn’t look like anything else on the fragrance counter, either! I also wear roses all year around, but I’m glad that Valentine’s Day is prompting more rose reviews. Now, I am curious about Evelyn Rose! Their Rosewater collection is very nice, especially the creams and shower gels. V, Evelyn has changed a bit over the years (as has its name! ), but it’s a very wearable peony-rose with a peachy-fruit aspect. Pretty bottle, too! Thanks, PF! Well, nothing will ever replace Lipstick Rose, or classic Bellodgia parfum, or a few of the Rosines, for me… but I’m always willing to try something new anyway. Hey Jessica! Nice review. Thank you. Which of the Rosines do you like best, and why? I tried Stella and didn’t like it…it smelled ‘little girly’ to me. I’m looking for a rose frag. that smells like roses, but can be worn at work…not a powerhouse fragrance I guess. Hi, MissyL! I love Poussiere de Rose (rose, plum, cedar), Rose Praline (rose, black tea, cocoa), and La Rose de Rosine (rose-violet chypre) the best. I think La Rose de Rosine could be worn during the day, as long as it’s not applied heavily. The same goes for Annick Goutal’s Rose Absolue, and you could even check out the Evelyn Rose that I mentioned above. Serge Lutens Sa Majeste La Rose and Jo Malone Red Roses both have many fans, although I don’t really care for either one on my own skin. I hope others will chime in with suggestions, too! … and another Rosine on my list is Secrets de Rose (black cap). These both sound like the fruity, very feminine style of rose fragrances. I don’t do very well with those, or with most of the rose-violet combos. Ones that suit my taste are dry, spicy, and/or earthy (Rosine Ecume de Rose, Malle Une Rose, LL Rose 31, OJ Ta’if, Miller et Bertaux Shanti Shanti, SSS Rose Musc) or straight-up celebrations of the rose (SSS Velvet Rose and the new natural, L’Emblem Rouge by EnVoyage). However, as a Caron fan, I will definitely try Delire de Roses. Thank you for the review, Jessica! Oh, nice list, H! I’m very fond of Ecume de Roses and Ormonde Jayne Ta’if and SSS Velvet Rose (and the darker SSS Vintage Rose, too). Jessica: Thanks so much for the review of Delire de Roses. I’ve been so curious about this one, but your comments incline me to pass on it, esp. at the price point. I’ll stick to my L’AP Drole de Rose or Lancome Mille et Une Roses for foofy girly roses. If Delire was about $50, I’d probably be more interested for something light and fruity (you should really try Ferre Rose for a well done sunny, fruity rose, composed by the rose king: Mr. Kirkdjian). Oh, I love Drole de Roses… I’m on my second bottle. Such a sweetheart of a fragrance. I just wish it lasted longer on my skin. I’m a fan of the Stella Rose Absolute, too… it’s very nicely done. I actually like the original Stella, too, although I got tired of smelling it on everyone for a while. There is a store in Austin carrying Caron now and they have the Delire de Roses parfum, in an urn and everything! I actually find that scent quite lovely. It’s still a modern rose, but I love the bready-foody part of it. I would want to try a few more times possibly, but I think it would be purchase-worthy for me, although maybe not near the top of my purchase list. I do think I’d prefer to have the Nuit de Noel parfum, though, for what it’s worth. Oh, lucky you! The one time I tried it on my skin, I liked the parfum so much. Although, you’re right, nothing can quite compete with Nuit de Noel… a classic! Oh, what is the name of that store? I sometimes go to Austin and I would love to check it out! Atelier 1105. It’s located in the Domain outdoor mall. I just smelled Delire de Roses last week, and I kinda loved it. Even though it is much girlier than I usually prefer, but I actually find that Caron really did capture the scent of roses in bloom. I think it’s okay to prefer the less complex fragrances in a perfume house – for me, I like that Delire de Roses is newer, younger, fresher than the traditional Caron fragrances, of which I haven’t yet found one I really enjoy. Will be blogging soon about my experiences at the two Caron boutiques here in Paris at http://perfumerookie.blogspot.com! I was at Neiman Marcus last weekend when they were promoting their huge giveaway full of goodies. “A Dozen Roses Electrons” was one of the sample fragranes I received. I’m not really a huge fan of floral fragrances but was hoping this particular one would “wow” me. It didn’t. It smells nice but there isn’t anything exciting or special abut it that stands out. When I wear a fragrance, I want it to smell amazing on me. It didn’t. I have to agree… the decription appealed to me, and the topnotes were interesting, but the whole thing just fell flat for me. Oh, well!